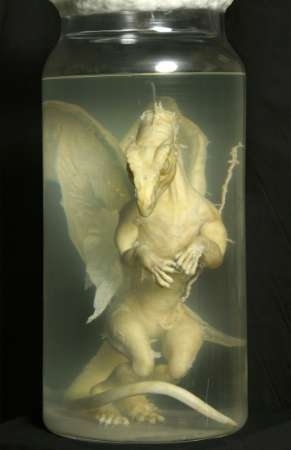 A pickled "dragon" that looks as if it might once have flown around Hogwarts has been found in a garage in Oxfordshire. "At the time, scientists were the equivalent of today's pop stars. It would have been a great propaganda coup for the Germans if it had come off. Mr Mitchell said: "The dragon is flawless, from the tiny teeth to the umbilical cord. It could be made from indiarubber, because Germany was the world's leading manufacturer of it at the time, or it could be made of wax. It has to be fake. No one has ever proved scientifically that dragons exist. But everyone who sees it immediately asks, 'Is it real?' "
From the reported sightings, Lord May concluded that dragons are "both omnivorous and voracious", with great variations in diet: one made do with two sheep every day while another, kept by Pope St Sylvester, consumed 6,000 people daily. Their lifespan seems to range between 1,000 and 10,000 years. Some scientists believe that dragons, though the product of imagination, were inspired by the extraordinary creatures that once roamed the Earth. As J K Rowling's alter ego Hermione Granger once suggested, legends have a basis in fact. According to the phonebook (http://www.bt.com/directory-enquiries/) there are two people called D. Hart in Sutton Courtenay. I called both and they are unaware of this find. As of yet I have not been able to find Allistair Mitchell either. 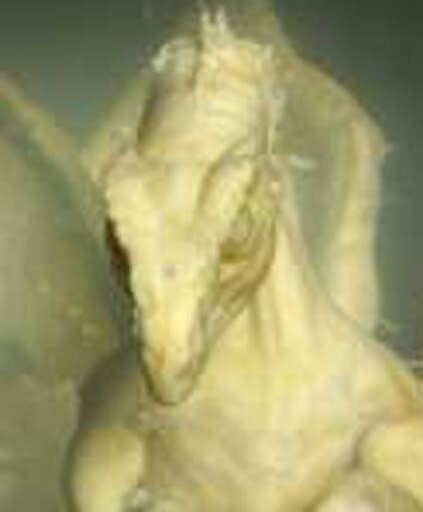 I have not yet seen the little model of a dragon but I hope to see it soon and perhaps include it in a piece we are doing for tv on fakes. It may also make an appearance on daytime tv (the Richard & Judy Show). Mandy Holloway Department of Zoology NHM"
Perhaps someone living in the area could help?